Consider ALL the holiday expenses. Holiday travel is one expense people tend to forget about. Especially for those that need to fly to their destination, the cost adds up quickly. Flights go up in price during the holidays and when traveling with the whole family it’s not uncommon for people to spend upwards of $1500 on travel alone. Anyone with high travel costs should certainly not overspend on holiday gifts. Family will understand that you spent a big chunk of change to be with them. A small and thoughtful gift should do the trick. Especially for those with little ones to buy for, it’s easy to overspend when trying to get everything on their list. Manage your expectations and theirs by making your budget clear. It won’t benefit anyone to rack up a credit card bill that will be nearly impossible to pay come January, so communicate with your loved ones and they won’t be disappointed when receiving their gifts. If there is some money left in the budget once all your shopping is done, you can even surprise friends and family with something extra that they weren’t expecting. When in malls, department stores, and big box stores like Target there are a lot of enticing items to throw in your cart as you go. While a $10 pair of earbuds or a $15 phone case may seem inconsequential, those items add up quickly. Picking up extra items can easily put you over budget, so stick to the plan. Keep a list of low ticket items you see along the way and pick them up if you have extra money left in your budget. Homemade gifts are always a good option for those on a budget. There are a lot of things that you can put together at home that friends and family will love. If you went on a vacation this year, make a scrapbook filled with pictures from your trip. A framed photo when combined with something like a candle or a gift card also makes the perfect gift. Homemade gifts can be very thoughtful, and help you stay in budget. Especially for parents or grandparents, something homemade might make them even happier than something you would buy in a store. The holidays are meant to be a season filled with family, friends, food, and fun. In a culture that’s a bit overzealous with holiday shopping, it can be easy to spend far more than you can afford. 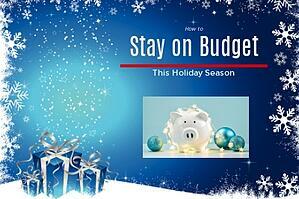 Breaking the bank this month will only lead to a stressful New Year, so set a realistic budget and stick to it. With the tips above, you can get all of your loved ones gifts they’ll appreciate while keeping your finances healthy too. Through mobile banking tools, your credit union can help members stay on budget. Ensure members are aware of mobile banking features that will help them set and track their holiday spending this year.